This coming autumn and winter company VTS, the owner of the VTS EUROHEAT brand, is focusing on quality tailored to your future needs. 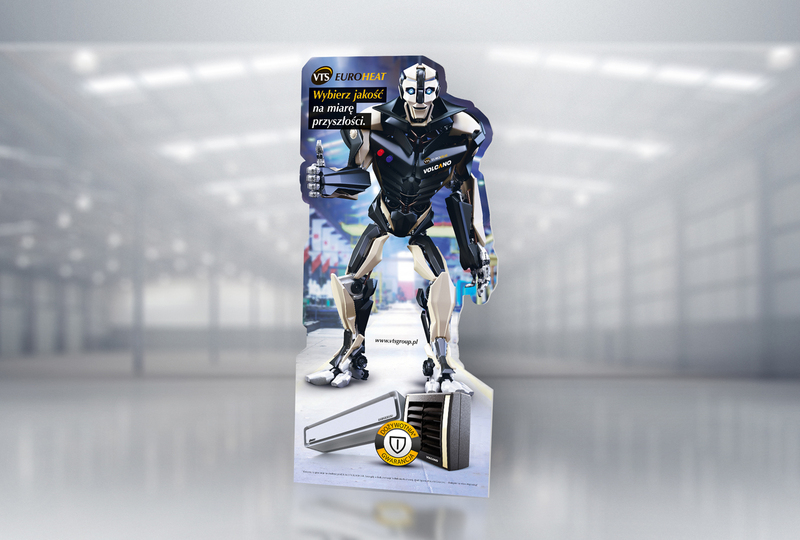 With the original brand hero- transformer made of its key product: the VOLCANO heater – it communicates to its customers that its products quality is like a warrior from the future: indestructible, always on guard over satisfactory operation, ready to help in any conditions and – what is the most important – simply timeless. A campaign within the ATL and the BTL channels will be launched in mid-September 2014. Looking forward to the coming heating season, VTS EUROHEAT have decided to present the quality of their products and business processes using a creation based on a brand hero, namely the VOLCANO transformer. A robot comprising elements of the VOLCANO heater is a synonym of what is the most important about the product: reliability, readiness to work in any conditions and care for (thermal) comfort of operation. It is also a hero bearing the palm of the market leader that is invincible in its category. The role of the brand hero is to focus emotions dispersed amongst competitive products and – by referring to the brand archetype, that being a warrior / ruler – achieving its profundity. ‘By means of the VOLCANO transformer personification we want to tell the story of the brand. A brand which – throughout all those years – has been evolving to achieve its most advanced form – the form of ‘a robot from outer space’ to which no mission is impossible, just like it is in the case of our heater’, says Karolina Różycka, EH Corporate Brand Manager. ‘Our robot is also the embodiment of innovative technological thought and VTS’ courage to develop pioneer solutions – both with respect to the business model, products or product components and marketing communication that goes far beyond the beaten track.’,she adds. The campaign will be pan-European, and it will cover all the markets on which the VTS EUROHEAT brand has been present so far. Marketing communication tools that have been designed to carry out the campaign include, among other things, numerous POS materials and BTL measures: newsletters, static and dynamic banners, multimedia presentations, ATL tools (press adverts) and internal communication. Be7 Creative Agency has been responsible for creation development and adaptation. The campaign will be launched in mid-September and continue until the end of the year.